More thoughts and theories, this time regarding that most abused, underrated piece of gear: the range bag. 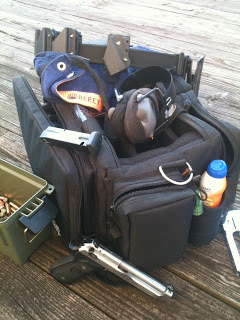 When I started shooting, I went to the range with a Beretta and a box of ammo. Now I have a range bag that is bigger than my first car, and my ammo won’t even fit in it. Before you leave for the range, make sure the magazines in your range bag fit the guns in your range bag. Ditto for holsters. Carry extra eye and ear protection in your bag. Somebody will show up without them. Multigun Match Math: 1 range bag + 2 arms + 3 guns + 4 types of ammo + 5 stages = GET A CART. Use black duct tape for patching your range bag. It’s more tacticool than the gray stuff. Spare gun: if your race blaster goes down in the middle of a match, and you drove 4.5 hours to get there, are you going to just leave? Of course not, that’s why you carry that huge bag! Break out the backup and get back in the game. Got fiber optic sights on your favorite blaster? Got extra fiber optic rod in the bag? Electronic optic? Check. Electronic hearing protection? Check. Batteries for both? At one time or another, there has been a holster, magazine, or part in your bag for a gun you don’t own. I carry two towels in my range bag: one for my guns and one for me. When I leave the range, my face is covered in gun oil and my guns are covered in sweat. First Aid: small bandages, sunscreen, bug spray, and Skittles are necessities for every range bag. Whenever a “discussion” ensues about the rules of a specific shooting sport, someone pulls a rulebook out of their bag. I’m that guy. Ink pens are scarcer than humility at a match. Carry a few, loan them out. You will never see them again. Squib rod: $10. Small screwdrivers: $5. Multi-tool: $30. That funky doohickey that adjusts my front sight: free with purchase. Having the right tool in your bag for quick repairs and adjustments at the range: PRICELESS. Stapler & staples: ever drive to range and realize you have nothing to put your targets up with? Gloves: if you’re an asset to our sport, you help with match setup and teardown. So just remember, splinters in the trigger finger can ruin your day. Guys, if you are carrying a range bag that is smaller than say, a child’s backpack, it is perfectly acceptable for your shooting pals to call it a “man purse.